Another Ford Mondeo ST200 Site? Er, yes, as a matter of fact. Another spur of the moment thing. My excuse is I wanted to try a new registrar and domain watch so I bought a few domain names which now all point here... hopefully. So, who or what is 2000RM? 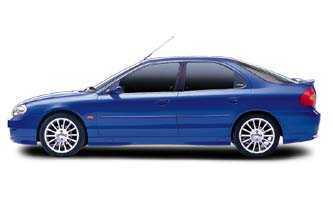 Well, it's a 1999 Ford Mondeo ST200 five door hatchback and not a bad car at all. I bought it at very short notice from my local Ford dealer when my well-thrashed Ford Scorpio 24V Cosworth finally gave up the ghost (engine was fine, but the auto box was knackered and with 120,000 very hard miles down, I'm not surprised it went). I'd just about bought a Volvo C70-T5 Coupe until the present Mrs. Morris spotted that it was only two doors and had a beige interior: not good with two kids... This was after she'd ruled out a Jaguar XJR on the grounds that it was a "look at me" car. My Scorpio was in the workshop with the dodgy box and the dealer lent me their ST200 - "it's only a Mundane-oh", I said - for a couple of days just to see how I got on. No complaints from my first wife, Amy was unruffled although she liked the colour and Jack was chuffed as it sounded like the baddies' car from "Bullitt". So I bought it, slapped on the vanity plate and here we are.